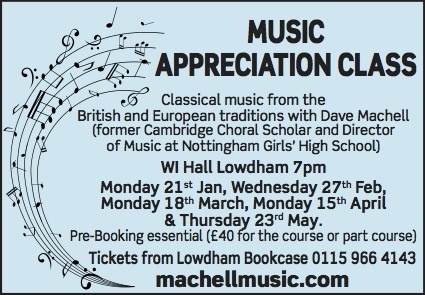 Classical music from the British and European traditions with Dave Machell (former Cambridge Choral Scholar and Director of Music at Nottingham Girls’ High School). Monday 21st Jan, Wednesday 27th Feb, Monday 18th March, Monday 15th April & Thursday 23rd May. Pre-Booking essential (£40 for the course or part course), Tickets from Lowdham Bookcase: 0115 9664143.